Natural Terminated Tourmaline Crystal collection from Brazil. This Tourmaline Crystal crystal collection is extraordinary. 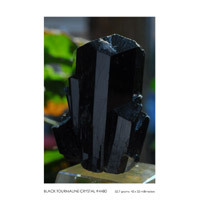 There are distinctive terminations and countless variations of crystal habits in this fine Tourmaline Crystal specimen collection. EUROPEAN UNION CUSTOMERS: PLEASE READ THIS! FREE SHIPPING ON ITEMS OVER $25.00!